Where Have You Been All My Life, Disney Springs? I had no idea what to expect when I climbed the stairs to the pedestrian walkway leading to the entrance to Disney Springs. During my many previous visits to Walt Disney World in Orlando, I never strayed from the major parks: Magic Kingdom, Epcot, Animal Kingdom and Hollywood Studios. I think I might have visited each of the water parks. Once. 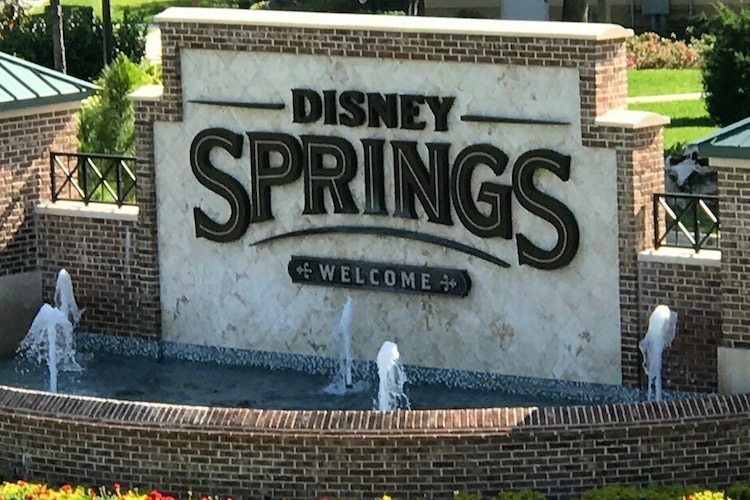 The entrance to Disney Springs is located about a 5-minute walk away from the Wyndham Garden Lake Buena Vista hotel. Photo: Cathy Bennett Kopf/The Open Suitcase. But I never, ever visited Disney Springs, formerly known as Downtown Disney. It’s been around forever, having opened originally as Lake Buena Vista Village in 1975. For several years it had an unsavory reputation associated with an adults-only section called Pleasure Island. Today, Disney Springs is a vibrant shopping and entertainment district that’s so popular, you’ll think you’re on Main Street U.S.A. during spring break, based on the crowds. It’s worth a visit on your next trip. With 55 dining options, everyone can find something they like to eat. If a hot air balloon ride is on your bucket list, you can check it off! Sometimes, you just need a break from the theme parks. Having no expectations and no plan, I gave myself permission to wander aimlessly around Disney Springs. It’s separated into different areas and my point of entry was in the The Marketplace, one of the identified neighborhoods in Disney Springs. The other two are The Landing and Westside. Children bounded in and out of spritzing fountains in a piazza ringed by stores. The first one that caught my eye was the Bibbidi Bobbidi Boutique. If you can say that 3 times fast, I’ll buy you a drink. I stepped inside and was greeted by a Fairy Godmother. “What is the Bibbidi Bobbidi Boutique,” I inquired, while gazing around the storybook interior of the shop. She told me that it’s a salon for children ages 3-12, offering princess and knight makeovers. “Only kids?” I whined, as she steered me out the door. At this point I realized I needed some sustenance to continue my exploration. An exploding volcano caught my eye. 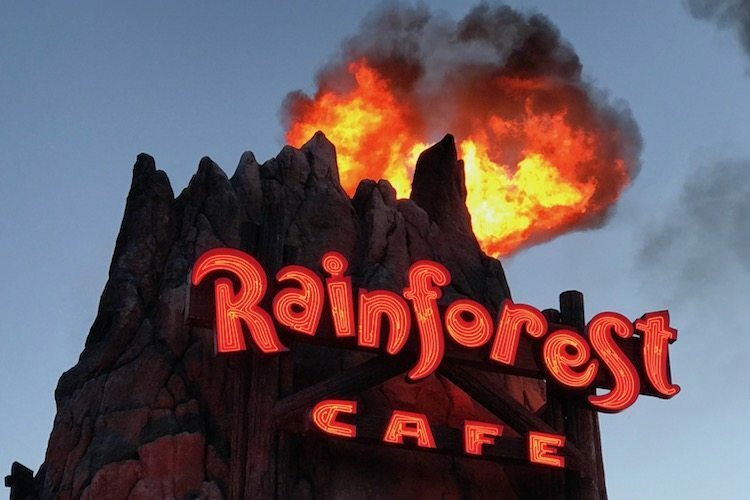 The Rainforest Cafe in Disney Springs is a great place to eat and to watch a volcano erupt in complete safety! Photo: Cathy Bennett Kopf/The Open Suitcase. Rainforest Cafe, a jungle-themed restaurant with 28 locations around the world, has operated at Disney for over 20 years. It’s so popular, that walk up guests on the Saturday night I was visiting were told it would be a 2+ hour wait. So, it’s worth making a reservation in advance. My friendly server offered a variety of suggestions and I took them all, starting with a not too sweet mojito accompanied by the Awesome Appetizer Adventure, a local redfish entree and the signature lava cake dessert. Every 20 minutes or so, a thunderstorm breaks out in the restaurant (simulated, of course). If you’re dining with little ones, warn them in advance. 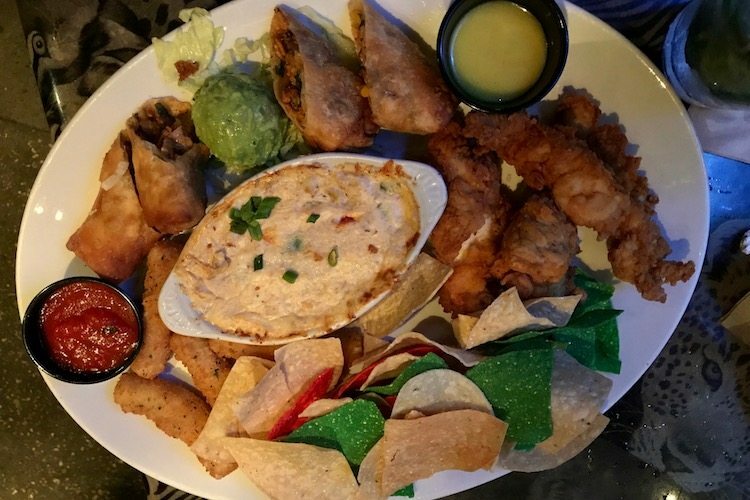 The Awesome Appetizer Adventure was a meal in itself at the Rainforest Cafe. Photo: Cathy Bennett Kopf/The Open Suitcase. Portions are huge, so sharing makes sense and there’s no split plate charge. Make sure you wander around to check out the different sections of the restaurant. I love the elephants and the pretty rainbow in the back. If you’ve left the kids back at the ranch and can enjoy adult beverages, the Lava Lounge is an outdoor bar area that serves the full menu and gives you a great view of the Disney Springs promenade and the waterfront. I had originally planned to return to one of the Walt Disney World theme parks after dinner to catch a fireworks shows. But the crowd was really buzzy at Disney Springs, so I decided to continue wandering around. There are lots of shops and restaurants crowded together in the Marketplace and the Landing. I picked up some souvenirs in the cavernous World of Disney store. If you go inside, don’t forget to look up to see life-size Disney characters suspended from the ceiling. A Disney World can be wildly expensive so enjoy the FREE action at Disney Springs. Transportation by water taxi. 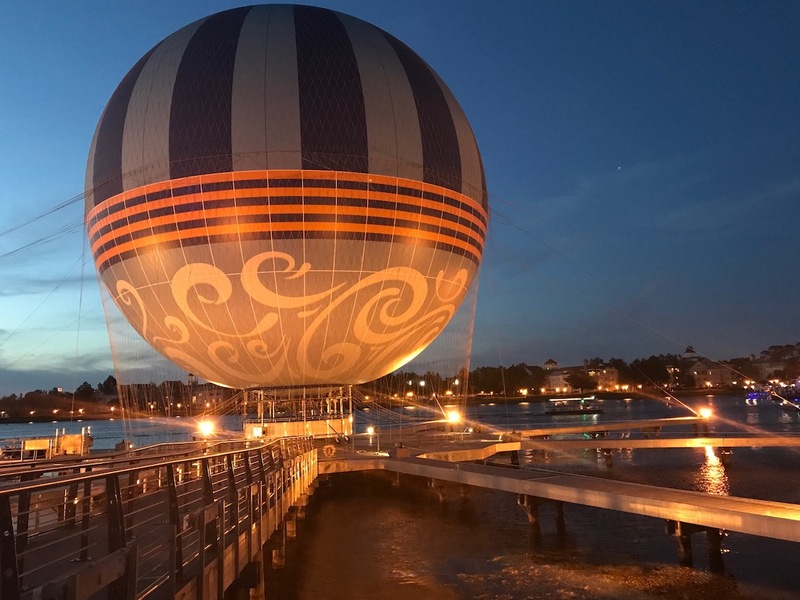 A fun to-do at Disney Springs. Photo: Cathy Bennett Kopf/The Open Suitcase. 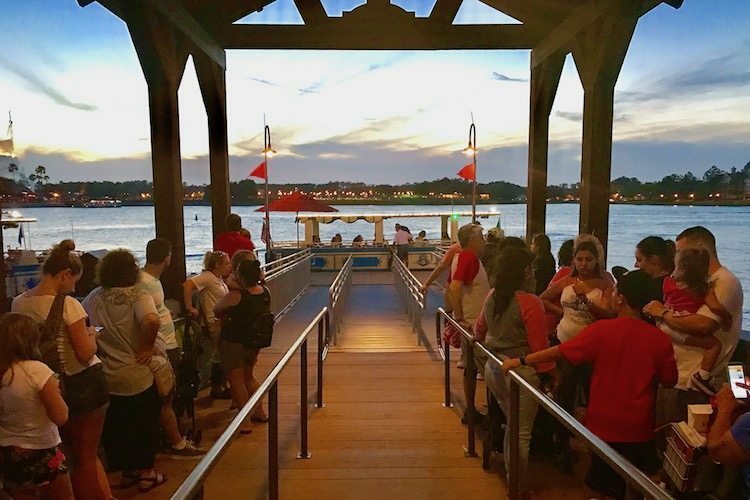 You can walk around Disney Springs or take one of the water taxis that travel between the villages and back and forth to several Disney properties including Port Orleans and the Saratoga Springs resort. Transportation to the theme parks is by bus. And there are several large, FREE, self-park garages. I heard the strains of Irish music coming out of a place called Raglan Road. I wandered in and edged my way to the bar where I had a great view of the stage. My friendly bartender Katie pulled a Guinness draft for me and I sat and sipped and watched some amazing Irish step dancers. There was clapping and hooting and hollering from the large crowd. The Orlando heat was still pretty oppressive, even at 10 o’clock at night. I would have loved to have stayed longer, but I was beat. Next time, I’ll hit Disney Springs in the fall and party till the wee hours. It’s possible, since Disney Springs is open until midnight. Fortunately, I was staying at the hotel closest to the Springs, the Wyndham Garden Lake Buena Vista. I’m going to let you in on a secret. 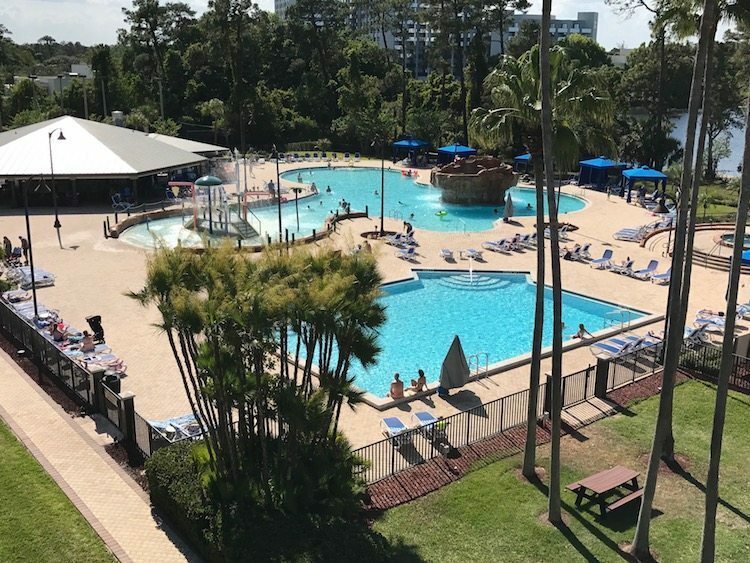 This Wyndham has all the bells and whistles of other Disney properties (park transportation, character breakfasts, hidden Mickeys) but the rates are blow your mind low. These days I veer towards luxury properties but I’m not afraid to dip my toe in a budget hotel tub, especially when it’s as crisp and clean as the Wyndham’s. The entire property sparkled, including the busy pool area. Uniformed attendants darted everywhere whisking away stray towels and cups. Visits to Disney often feeling like I’m pulling on a familiar sweater. Because I’ve gone so often, it feels comfortable, but maybe a little boring. I’m so happy I detoured through Disney Springs. It earned a spot on my “must-do” list for future visits. Disclosure: Consideration was provided by brands mentioned in this post. But, as always, the opinions and impressions expressed are my own. We go to WDW 2 – 4 times a year, but rarely went to Downtown Disney. I agree that the newly “reimagined” Disney Springs is now a must-do! Did you happen to try Jock Lindsey’s? No. Wish I’d had 3 more nights to eat my way around Disney Springs. And to shop. Picked up the cutest things for my nephews and didn’t have to schlep the bags through Magic Kingdom.